Using the data from Adecco’s global study, this infographic breaks down how recruiters can effectively use social media for online recruiting. The data is gathered from the responses of recruiters from 24 countries. 1,501 recruiters participated in this study, 73% using at least one social media account for professional purposes. 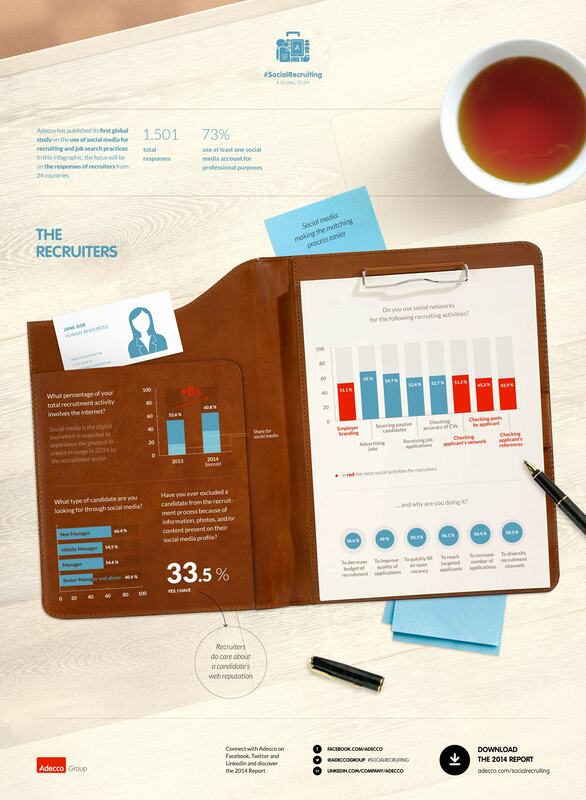 For more information on the study you can download the full report at adecco.com/socialrecruiting. Recruitment increasingly uses the internet and social media as a crucial tool. Typical candidates recruiters are searching for are non-managers. First impressions are everything! Recruiters admit candidates have been rejected due to the content on their social media profiles. Be careful with sensitive information! Recruiters are using social networks to source passive candidates, checking the accuracy of CVs, checking an applicants network, even their posts! How much does of your recruitment work involve the internet? Let us know in the comments below.